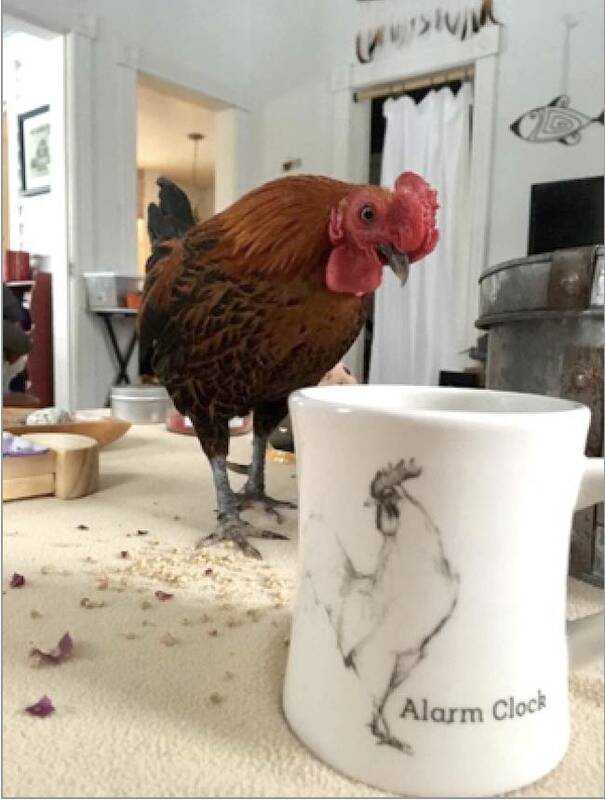 In honor of International Respect for Chickens Day May 4/Month of May, we’re delighted to share with you this inspiring story by Melanie Jacobs. Roosters have granted me an understanding of spirituality in ways I never expected. I guess partly it may be because alcoholics feel “disposable” and roosters are viewed the same, so I feel a huge pull to help them and create awareness that they matter, just like us alcoholics. Hi, my name is Melanie, and I’m an alcoholic. My full time job as an addiction counselor keeps me on my toes. In my free time I care for my beautiful companion animal family that consists of 13 animals, with my very understanding husband. I have been sober for just over 10 years now. Recovery from alcoholism involves spirituality and believing in something greater than ourselves. Having identified as an atheist most of my life, I assumed there was no place for me in recovery. Luckily, I was later told that I could believe in anything I wanted as far as spirituality went. Ever since my first whale watching trip in 1996, I have held a deep spiritual connection with orca whales after two of them surfaced near my kayak and swam under me. Living in Minnesota is not conducive to whale watching. I was lacking a spiritual connection in my landlocked home state. When I was 7 years sober, I became a vegan. It was shortly after my cousin asked me, “Why do you care about whales so much but eat other animals?” This was eye opening to say the least. Becoming a vegan opened up a spiritual dimension for me I never knew existed. When I first became vegan, I volunteered on a few occasions at Chicken Run Rescue. At that time, they were the only farmed animal rescue in Minnesota. I went into that experience thinking, “Bummer, I want to see cows and pigs, not just chickens.” Just chickens . . .? 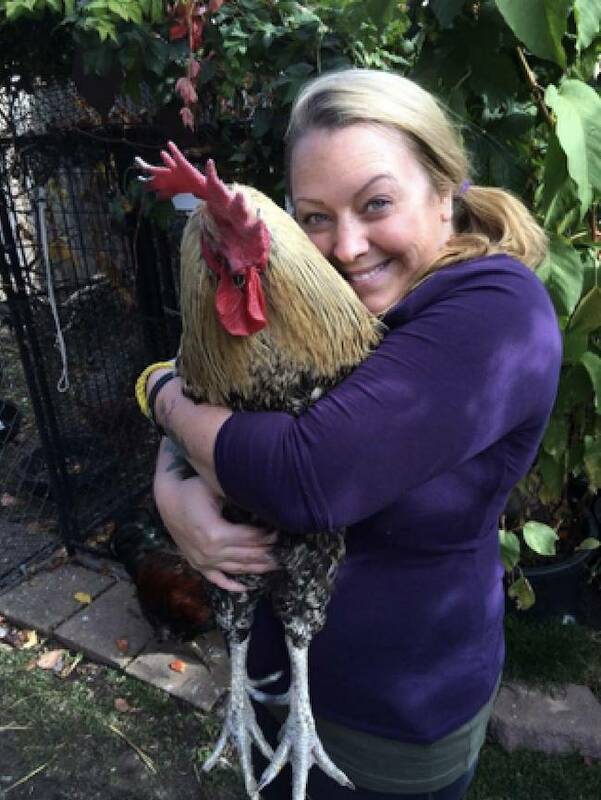 I instantly fell in love with chickens, particularly a giant rooster named Butler. As a new vegan, I was still in that mode of speciesism, that certain animals were better than others. That changed very quickly and I knew one day I would also rescue chickens. 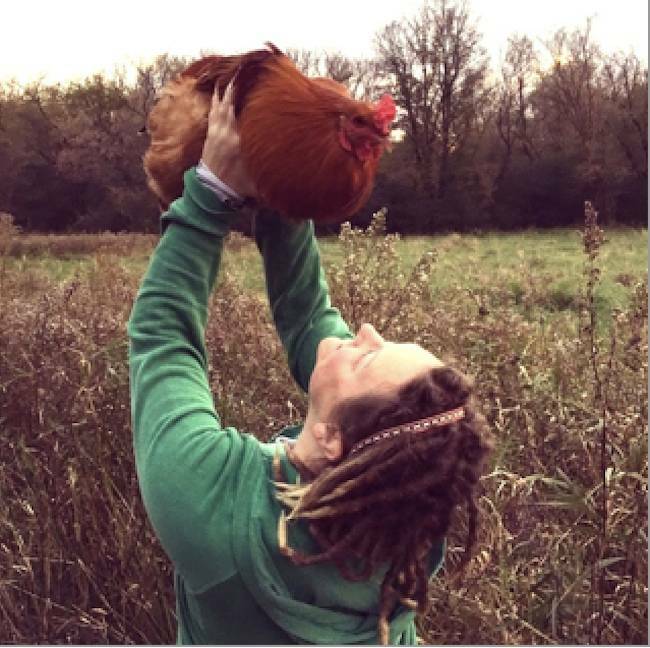 In the winter of 2016, my spirituality blossomed even more when my husband and I bought an 1895 farmhouse with 6 acres, a barn, stable, and chicken coop. In July 2016, our microsanctuary Rooster Redemption was born, when I took in 3 roosters from a school classroom hatching project. Nacho, Cain, and Koda had gone to the home of a backyard chicken farmer after the school was “done” with them. Once they started crowing, they instantly became unwanted and prohibited in the city they lived in. This is the most common issue for these lovely birds, the “Oops, it’s a rooster,” since many people have significant difficulty sexing chickens at young ages prior to crowing. SSince our first 3 rescues, we have taken in 6 more. Their previous situations range from school hatching projects to religious rituals to cockfighting busts. It gives me great satisfaction to care for these birds and see them safe every day. In a way, Yes, I do.